Several heavy hitters of the Australian funds management industry have come out in attack of indexing. A much smaller minority, including Steve Johnson from Forager Funds have publicly acknowledged that the secular shift is happening for good reason, and is likely to accelerate. Globally ETFs are estimated to save investors $20 billion a year in costs and taxes. They continue to grow in popularity for convenience, cost and because most active strategies are no longer able to earn their keep. ETFs give investors access to the same underlying investments for a lower fee. 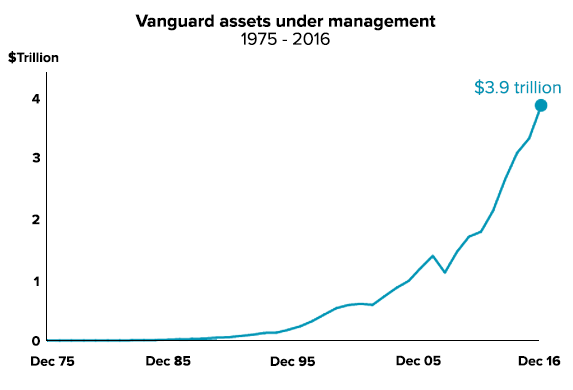 Over the last 3 years, indexing behemoth Vanguard has taken over $800 billion in new funds. That’s 8x more than every other fund manager in the world combined. Active managers are understandably anxious. Their reaction? A campaign of myths and mistruths about ETFs. The most popular myths would have you believe that indexing distorts fundamentals and impacts liquidity. These are easily refuted with some basic data and knowledge of how ETFs work. Myth #1: Does indexing distort markets? ETFs are just a tool for accessing investments, they can’t be blamed for causing markets or individual shares to go up and down. For example this year Telstra shares have fallen 15% while CSL shares have risen 35%. Both are major components of the S&P ASX/200 Index and Australian ETFs but clearly it’s not flows into indexing that have caused these divergent moves. Their share prices have been driven by the thousands of active stock pickers doing what they do best – buying and selling to determine the price. As for ETFs making markets dumb, they simply don’t own enough of the market to have real impact on the price discovery process. In Australia ETFs account for $28 billion, less than 2% of the overall market. Furthermore, they don’t trade nearly as often as active investors. Index ETFs by definition trade their holdings rarely so most of the time they just hold. 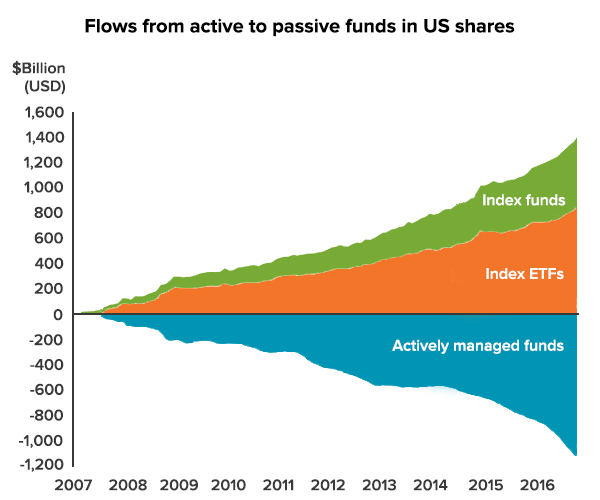 Even in the US where indexing accounts for 28% of the market, the overwhelming majority of trading is still done by active investors. To say ETFs indiscriminately drive prices up and down is plain wrong. If ETFs were causing shares to be mispriced this would create arbitrage opportunities for active investors. Active fund managers would be celebrating, not bemoaning ETFs! Myth #2: Is indexing causing a market bubble? Markets have gone through cycles since the start of time due to economics, governments, monetary policy, investor herding, flow of funds, business fundamentals and other factors. Whether someone is picking the shares in a portfolio, or using an index to invest makes no difference. Flow of funds into markets has always been pro cyclical (people invest more when markets are up). Take 1999 for example, the year of the largest flow of funds into US tech shares ever. This was well before the trend of indexing took off, yet there was no shortage of active fund managers eager to buy tech stocks at the peak: The ANZ Global Technology Fund, the BT Technology Fund and AMP Capital Global Technology Fund to name a few. Not one was an index fund or ETF. The simple fact is that 80% of share trades are conducted by active managers trying to beat each-other in a zero sum game. For every active investor who beats the market, there’s another who has lost. Investors in actively managed funds are certain to underperform the market by the fees charged by these funds. Without ETFs money would still be invested, but via active funds instead. Those active funds would own the same stocks, in the same aggregate weights, just for a much higher fee. Active fund managers do not have a better track record of picking stocks or timing markets than indexing. This includes market falls like 2000 and 2008 when active managers performed on par with the index. Think of ETFs as being like Netflix. Some people can now watch movies that they wouldn’t otherwise be able to see. Others can do it in a much more convenient and cost effective way. Myth #3: Do ETFs have liquidity issues? Another common myth is that ETFs are menacing due to the possibility of lower liquidity during times of market stress. Liquidity is market related not product related, and applies equally to active funds. Both invest in the same underlying securities so if liquidity dries up, everyone is impacted equally. The creation and redemption process behind ETFs means that they are actually better equipped for these situations, where active funds are more likely to put up the gates to lock up investor funds. Are there dangers of ETFs? There are risks for ETFs – mainly that they become the next plaything for traders. Of particular interest are the new breed of ETFs; triple leverage, active ETFs and others that offer the ability to gamble on any multitude of market factors. Unfortunately, the temptation to try and beat the market is too strong for many to resist. ETF issuers are filling that void with products that enable new types of market bets. People who transition from trading shares to trading ETFs will discover with time that outperformance is eroded for the same reasons. Market factors (like growth and value) come and go in the same way that stocks and sectors outperform and mean-revert in an unpredictable way. Investing for outperformance has enjoyed a remarkably long life cycle as a business model. The ironic success of active fund managers is they have collectively eliminated the opportunity to achieve superior performance so much so that it is not a game worth playing (for clients at least). What does this mean? Advisers have an opportunity to stop focusing on price discovery (picking stocks) and transition to structuring sensible long-term investment portfolios and encourage clients to be disciplined to stick with them. This is precisely what we focus on doing here at Stockspot. For those who rely on active stock picking for their careers and businesses, ETFs remain the easy punching bag because livelihoods are at stake. That raises some ethical questions around whether self-serving interests are being put ahead of investors and clients. In the meantime there’s one group you won’t hear complain about ETFs – those who invest in them.